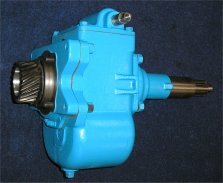 What is the shuttle transmission? 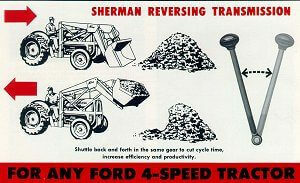 In the later ’50s Sherman offered the shuttle or reverser transmission that simply reversed the input to the regular transmission and gave you all the normal forward speeds when you were going backwards. This was handy for the Fords that were being used as forklifts or for loader work as one lever could change the tractor from forward to reverse at the same speed as the gear the regular transmission was in at the time.